Choose art equipment which has simple and safe operation, high efficiency and energy conservation. Helping to make wheat flour, wheat semolina and wheat bran according to your needs. We can supply Safe and dependable design mode, reasonable installations by experienced engineers. Friendly pre-sale service, sales service, prompt delivery, professional after-sale; your shall be enjoy the turn-key service. 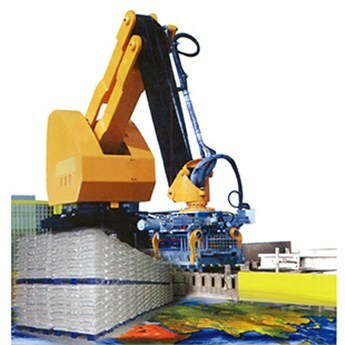 Application scope: the palletizing robot is widely used inflour industry, feed industry, fertilizer industry, cement industry, beer industry, grain and oil industry, seasoning industry, daily chemical industry, wine industry, bottled water industry, barreled water industry, beverage industry and other industry bags, boxes, barreled products. The ingenious four bar linkage makes the robot’s action program simpler and more precise. The high strength aluminum alloy arm not only makes the arm move more flexible, but also reduces the energy consumption. 3. Simple teaching operation and friendly graphical user interface. ● It has less teaching position and simple operation interface, which makes on-site debugging easier and the efficiency of the field greatly improved. ● High precision field action simulation software can be used to understand the normal operation of the scene in advance in your PC. Automatic interference detection avoids the occurrence of interference. ● Using powerful 3D simulation software, you can easily complete robot programming in the office. The layout, interference detection and field action simulation have become simple and effective, thus greatly reducing the debugging time in the field and improving the overall production efficiency. Note: the maximum capacity under the manufacturer’s development conditions is related to the actual stacking capability and the distance, the weight of the products and other field conditions. How to Identify good quality flour? Why Can Earn Big Profits By Maize Milling Factory? SHIJIAZHUAGN HONGDEFA MACHINERY CO., LTD 2019 | Powered by WordPress.